I wish to thank you all for making the Fall bazaar on October 13th a wonderful and successful event. Special thanks to the Espace 99 community center for giving us the wonderful venue free of charge. The turnout was amazing. We had more than 300 people attending throughout the day and evening. 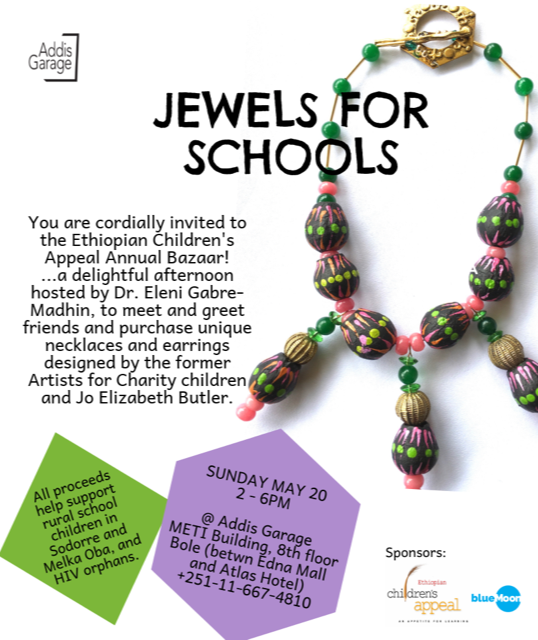 There were beading classes for children who used their creativity to make wonderful necklaces and bracelets. Also, please visit a video film on YouTube that was very generiously filmed by local high school volunteers – look here and a special thx! There was a professional Ethiopian dancer who provided all with a great display of the many traditional Ethiopian dances and costumes. We had a wonderful puppeteer who regaled young and old alike with a theatrical show about the perils of climate change. The puppeteer, Liviu managed to entertain and to educate us all. Awash Restaurant provided delicious Ethiopian food through the day and evening and a coffee ceremony with free coffee tasting was available for all. Wonderful items were on sale including Jo’s new line called Schoolery: jewels for schools, Marika’s beautiful hats, scarves and necklaces from her boutique in Carouge, Volupte, Maria’s corner with beautiful jewelry for Christmas, Serena’s place with lovely jewelry made of murano glass and lace bracelets and Carol’s chic beads with original and affordable necklaces, bracelets and earrings and Zaid’s fashion showcasing original Ethiopian dresses and scarves. Also on display were the wonderful leather bags made by Chris Murner of L’Antre Peaux, Carouge. There was a great fashion show and a fabulous musical combo group called the Undersigned which entertained the guests with the wonderful singer, Jahjarang. We were able to raise more than Fr.13,000 all of which will go directly to help 1000 children in Ethiopia. These funds together with those collected at the June Spring bazaar will help to build more classrooms, supply individual solar lights to hundreds of rural families thus helping children to study at night, planting more vegetable gardens, installing compost toilets at the schools, ensuring clean water supplies, delivering the annual six thousand notebooks and supplies, restocking the newly built libraries and purchasing tables and chairs, refurbishing the health clinic and installing solar power at the clinic, as well as helping HIV/AIDS children in Addis and starting a new program of providing vocational training scholarships to graduating high school students. All of this is possible because of YOU! Your continued generous support makes all of this possible. Special thanks to the many volunteers who worked tirelessly to help make the bazaar a success. A very special thanks to the Lausanne Hotel School and their corporate responsibility team who donated their time to help. And a special thanks to Cheesecake and company of Geneva for their wonderful donation of scones, muffins and sweets.